Second language learners are often able to understand more than they can produce. This gives rise to questions about the overlap between comprehension and production, and about the processes of acquisition. For instance, can comprehension training pre-empt errors in production? Several researchers have suggested that grammar learning takes place by first acquiring knowledge of a grammatical structure and subsequently fine-tuning this knowledge and the processes related to it. Two experiments were conducted. A pilot experiment was designed to investigate whether knowledge that is practised in comprehension tasks can pre-empt errors in production, and to evaluate what amount of training is sufficient in this respect. A main experiment was conducted in order to assess whether receptive training could improve performance in comprehension and pre-empt errors in production, and to test whether the early introduction of production tasks would influence acquisition. 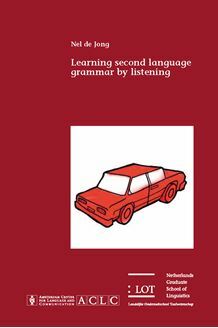 This study shows that it is possible for second language learners to induce some grammar knowledge in an aural comprehension training. Although this training led to increased processing speed in comprehension, it did not pre­empt a substantial number of errors in production. An early start of production training did not severely hinder acquisition. Further research needs to assess exactly how training can contribute to knowledge and processing, in comprehension as well as production. The present study extends research findings of training effects to the aural modality, that is, to listening and speaking. Methodologically, it aimed to enlarge the range of tests for second language research. Results from this study may also have important implications for the practice of second language teaching.